There is something awesome about crafting a tale from a blank sheet. My first idea for a novel was but a seedling when I was eighteen. It was not until much later that I put pen to paper and started to write. A friend shamed me into it after I showed him my first few pages in its early infancy. Every time we met afterwards he would ask how it was going and to my shame I hadn't done anything new. It was at this point that curiosity overtook events. Could I write a sweeping tale? A lot of friends ask how I find the time to write. To me it is the same as reading and I love that. Instead of reading, I write. It's as simple as that. This is the part when you can tell if you are writing for fun. 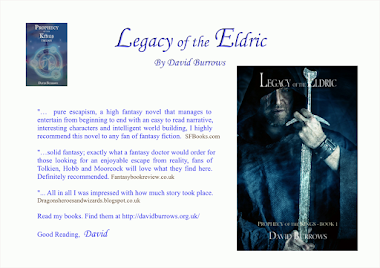 For my first novel, Legacy of the Eldric, I was in no hurry. I wrote myself into corners where I had no concept of where the plot was going. In some respects it was frustrating. It was a little like those Saturday morning matinees - where Flash Gordon is left in a cliff hanger situation and you had to wait a whole week to find out what happened next. Often the wait was a disappointment when the story line recommenced at a point that you didn't quite tie up from the previous week's episode. As a child you felt the disappointment keenly but by the next cliff hanger it was long forgotten. I was determined not to allow that to happen in my novels. If the tale took me to a cliff hanger I was not going to simply rewrite the tale a few pages back. I mused for hours on buses and trains, trying to think of the solution. I enjoyed that and when the Eurekamoment came, it was like turning the page of a book. It was almost as if someone else had written the story and whispered it in my ear. That was incredibly fun and rewarding as I rushed home to continue the tale. One concept in my tale is that of a shaol. 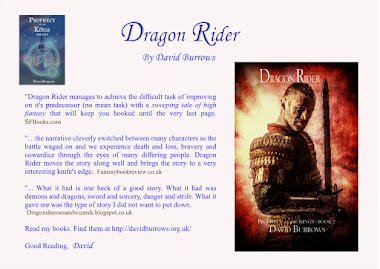 I am a fantasy writer, although I would like to write a historical fiction. A shaol is a guardian spirit which explains why folk have feelings of déjà vu. 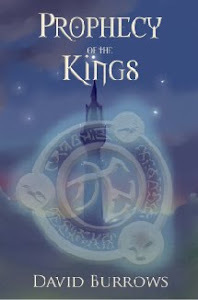 It adds an element of unknown to my tales, which I really enjoy. I think we have lost the sense of wonderment we had as children and to me that is what fantasy is about. Lord of the Rings and especially the Hobbit captured that perfectly. So, in a sense, someone whispering in my ear may have been true. I particularly enjoyed writing a short tale about one of my characters, Vastra, handing me the novel, The Prophecy of the Kings, on a cold winter's evening. Vastra's Tale- I enjoyed writing this short piece which seemed to link really well to the shaols in my novels. I have always had active hobbies, taking me outdoors. I was keen on mountaineering when I lived in Scotlandand I joined a Saxon/Viking re-enactment group, Regia Anglorum, later in life. But writing has slowly overtaken these hobbies. The reference to Flash Gordon may have given away my age which might have something to do with this. I have always been a bit of a daydreamer so disappearing into the world of my novels is rewarding in itself. Mood music helps me to write and set the scene. Something soft in the background is good. For fantasy it needs to be something I can associate with the subject. Enya and Mike Oldfield are firm favourites for that. Finally, where I write is important. I find writing on trains gives me that creative edge. Perhaps it is going on a journey that helps. Seeing fields go by and perhaps linking my characters to the view seems to add to my creativity. Writing my novels was fun. 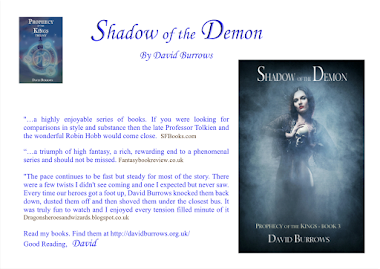 My new novel Drachar's Demons was written much faster than Prophecy of the Kings, perhaps because it was a prequel and much of the background had already been formulated.